A government-commissioned review published on Tuesday has found various aspects of the detention system “deeply troubling”. The UK operates a vast immigration detention estate, one of the largest in Europe, with a dozen long- and short-term centres across our cities and towns, hidden away in the countryside, or next to airports. They are effective ‘black holes’ where basic legal, civil and human rights are deliberately placed out of reach. Over 30,000 people are locked up in prison-like conditions every year, with no time limit on how long they can be held. The negative impact on people’s mental & physical health can be long-term, while at the same time the Home Office systematically ignores medical advice to keep mentally ill immigrants in detention. Last year saw ten detainees die in different centres, often by suicide, making it the deadliest year on record. Last month saw the Merseyside launch of ‘These Walls Must Fall’ campaign. Covered in Nerve, it saw over eighty people hear from experts-by-experience, activists, trade unionists, pensioners, and residents of Liverpool come together to coordinate challenges to detention in the immigration and asylum system. The campaign is most active in Merseyside and Manchester, and has the support of various local groups including migrant rights organizations, trade unions, trade councils, universities, pensioner groups, and religious groups. It is led mostly be people themselves at risk of detention. Among other work, campaigners have been securing support from councils. Last November, Manchester City Council become the first local authority in Britain to pass a motion condemning immigration detention. It was followed this April by Cambridge and Brighton & Hove. Three weeks ago Islington became the first council in London to endorse These Walls Must Fall. 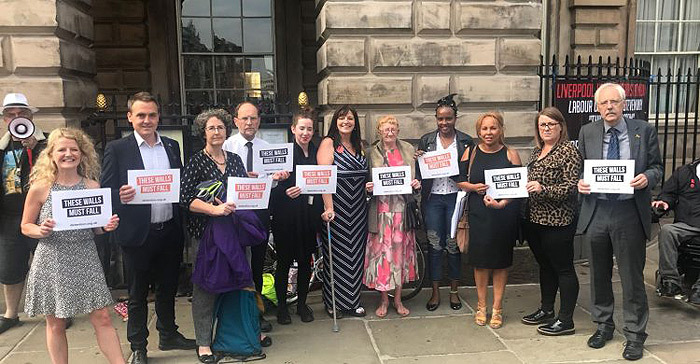 Chelsea Ningabire, an activist with the These Walls Must Fall campaign in Liverpool, said: “I would like to thank the city council for supporting our campaign.